Dance Commentary by Heather Desaulniers: "Story/Time"
A favorite at Cal Performances, Bill T. Jones/Arnie Zane Dance Company returned for one weekend to bring their new work "Story/Time" to West Coast Audiences. 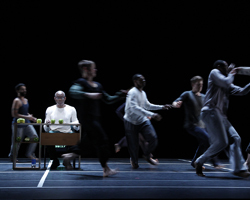 A departure from the typical (if there is such a thing) evening-length composition, "Story/Time" is comprised of seventy 1-minute remembrances, spoken center stage by Jones, while the company's dancers fill the surrounding space with movement and scenework. While both the narration and choreography were enthralling, "Story/Time" really seeks to examine the co-existence of form and content in modern dance. Jones has spent a lengthy and successful career examining the juxtaposition of these two entities and this new work is his dissertation on their present state in his consciousness. Before the piece began, Jones came out and gave the audience an assignment: to judge how long a minute really is. At a given mark, the stage manager began a stop watch and the crowd was asked to raise their hand when they felt sixty seconds had passed - depending on your perspective and judgment, that time was either super short or very long. With that context established, Jones walked to his desk and began speaking. His seventy short memoirs occurred in random order and ran the gamut of funny, sentimental, whimsical, and sad - a stream of memories. Similarly, the choreography was a stream of physicality, a string of steps and sequences, not at all trying to representation or 'act out' the words that Jones was speaking. Jones is such a commanding presence that I found it hard to look anywhere but directly at him, even as the dancers began moving around, amidst and in front of him. For the first third of the dance, I really had to force myself to look at them. That feeling did lessen and as "Story/Time" came to a close, I realized that I was actively engaged with both the movement and the narrative. The choreography (the abstract form) and the script (the informational content) shared three things in common. First, they contained a phrasal quality: each had highs and lows, climaxes and valleys as the respective material unfolded. Second, both the structure and the narrative related to the notion of observation: Jones' words were audible recollections of real-life events and his choreography, a visual picture for the audience to take in. Third, both the dance and the language came from a place of intimacy and vulnerability; both shared intensely personal experiences with us. But for the most part, the movement and the message were unrelated. They were certainly living in the same space, though despite this adjacent placement (and two scenes towards the end where the dance did actually mime Jones' words), the two were unattached. Was this independence good or bad, or simply how things were? That answer is for every individual to decide. For me, it was a wonderful expression of the unanswerable: in this case, how form and content are connected in modern dance. "Story/Time" puts the two together onstage yet for the most part, doesn't attempt to combine them or explain how they relate to each other.